Just typical. No love life to speak of for months, then all at once, every horny creature in the Otherworld wants to get in your pants. Eugenie Markham is a powerful shaman who does a brisk trade banishing spirits and fey who cross into the mortal world. Mercenary, yes, but a girl’s got to eat. Her most recent case, however, is enough to ruin her appetite. Hired to find a teenager who has been taken to the Otherworld, Eugenie comes face to face with a startling prophecy – one that uncovers dark secrets about her past and claims that Eugenie’s first-born will threaten the future of the world as she knows it. This book was recommended to me by a fellow shelf browser at Waterstones bookstore when I went on a retail therapy a few weeks back. It came very highly recommended so I bought it. Talk about gullible! The story itself is not very original. If I have to give it a score, it’ll be a 1 out of 5. It smacks too much like a female Harry Dresden by Jim Butcher. Or, the same tattooed protagonist in Mercy Thompson by Patricia Briggs. Or Kate Daniels in the Magic series by Ilona Andrews, ring any bells? Cassandra Palmer? I could go on and on. So… originality? Hardly. But what makes me buy Jim Butcher, Patricia Briggs and Ilona Andrews again and again even if they are not very original either? It’s the masterpiece story-telling quality! However this book’s story-telling quality is only about a 2 out of 5. Not very compelling at all. Plus the protagonist is just a shade this side of stupid. About one third into the book and I just know who our protagonist’s father is. And guess what, I was right. It sort of deflates the suspense effect when one finds out one is right about the story. The cover art is not bad. I would give it a 4 out of 5. The lightning and the wand appeals to the fantasy buff in me. So, what have we got? A not very compelling story-telling quality, a story which is not very original at all and predictable to boot but good cover. Overall, I would give this book an entertainment value of 2 out of 5. 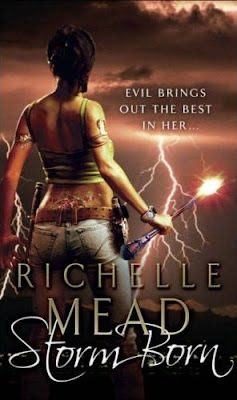 Would I read another Richelle Mead? I would like to say no, but I already have a few of her books. But if ever I would read a Richelle Mead which I don't already own at this point in time, I’d borrow from the library than buy it. I have the book on my shelf. I tried to read it a few weeks ago and I couldn't get past page 30. I set it aside to try it later, but I don't think I will like it.